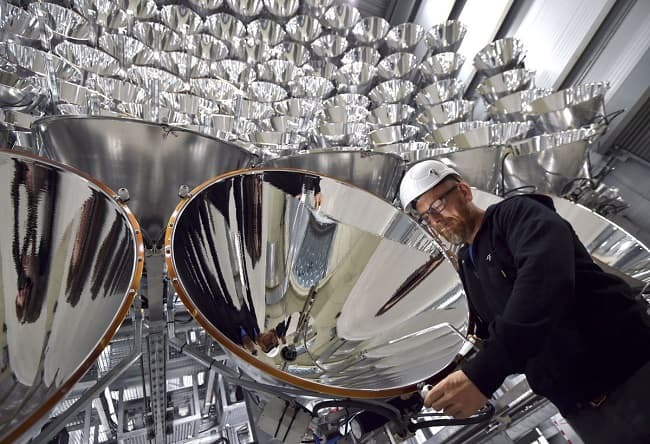 On Thursday, German Scientists have turned on the world’s largest artificial sun, Synlight, that can reach temperatures up to 3,000 degree centigrade. This three-storey setup is made up of 149 Xenon short-arc lamps arranged in honeycomb structure. These are the same lamps used for illuminate screens in cinemas, also put to simulate sun’s radiation. Engineers behind this megastructure hope to get some insights in field of green-renewable energy through this intense light source. Synlight functions in a manner similar to a magnifying glass. All of the 149 ‘radiators’ are focused on an area of 20 by 20 cm resulting in 10,000 time increase in the solar radiation compared to normal intensity at Earth’s surface. Researchers are going to use it for testing their method of producing alleged ‘fuel of future’ i.e. hydrogen. But, it itself consumes energy equivalent to annual consumption of a four-person household in an hour. Is there a real need of using artificial setup like Synlight? There’s a reason why artificial sun is required and natural sunlight is not used for research purpose. The intensity of solar radiations varies widely throughout the day and also depends on weather conditions. This can negatively impact test results. In addition, artificial setups produce exactly similar conditions every time which is crucial in development work. Scientists at DLR Institute of Solar Research successfully produced hydrogen using solar radiations, eliminating the need of electricity completely, in a laboratory scale experiment. In order to realize the dream of using hydrogen for industrial application, the whole setup needed a scale up for further study. This is the prime reason for existence of Synlight. 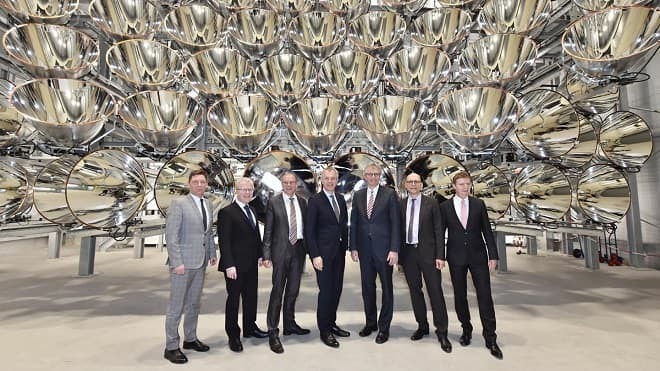 Once the setup successfully produces hydrogen from 350-kilowatt Synlight radiations, it can easily be scaled up tenfold, said Mr. Hoffschmidt, director of DLR. He also added, by combining carbon monoxide with hydrogen it’s possible to make eco-friendly fuel for aviation industry.